The Moral of this Story is that a time of Trouble is a good time to ask God to help us. He alone can provide protection for us in the midst of the worst storm, and He alone can bring good out of even very bad happenings. The Midwest or Central part of America where most of the Stadem descendants live is where most tornados appear every year. 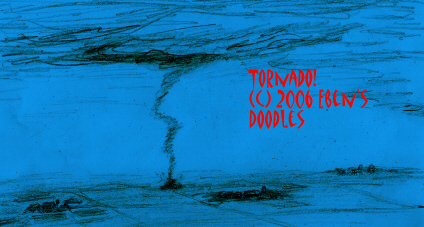 Tornados are known for doing very odd things. They can somehow shoot thin strands of straw completely through wooden fence posts without breaking the stems of the straw. There are pictures taken you can see that show the straws sticking completely through fence posts. Tornados also sometimes lift things up and set them down quite a distance away without damage. A baby, as well as dogs and cats, have been picked up and set down that way, without any harm to them, according to the news. Should we be scared though of them? It would be odd if we weren't scared of tornados. Some people make a living today chasing them and photographing them, and weather people also do this to study them, but ordinarily, people are too sensible to want to get that close to them if they can help it. Plain View Farm has seen a tornado or two in its day. Nearby, the town of Bryant has seen even more tornados come and smash buildings flat to the ground. Fortunately, the house at Plain View has been spared, but Alfred Stadem's grandparents, Sjur and Oline Stadem, had a worse time. Their first house in this Bryant area that was being constructed was completely destroyed, so they moved in with their sons Ole and Berent Martin on their farm. Alfred wrote and described the time his grandparents had that close call with the tornado. It didn't take the barn, but it completely wrecked the new house his Grandpa was building. The men had just enough time to scramble out the sides of the unfinished house and drop to the ground before the house was whirled away by the tornado and destroyed! The family looked for anything left of it, but there was nothing except a picture of the family found about two miles from the farm. They were so amazed to find even this picture! How thankful they must have been that their lives were spared, and no one was hurt. Well, the tornado that wrecked Alfred and Bergit's first barn on Plain View Farm grabbed the cutter--a kind of sleigh the children used for going to school and was drawn by horses--and set it way up on the barn roof. There is a picture of this you can see in the family albums. The tornado did so much damage to the barn that Alfred Stadem had to build a new one, which he called the Basement Barn. He used a much timber, nails, and other things from the wrecked barn that were still good, and added to it whatever he could find in abandoned houses and buildings in the area, as well as bought what he couldn't find or salvage. When he was finished, the Basement Barn looked good with its new coat of paint, and a pony painted on the south side high up, and the two diamond windows, and PLAIN VIEW FARM painted in white on the west side. There aren't many things scarier than a tornado. Earthquakes can be just as bad too. Isn't it good to know that God is greater than any storm cloud or bad thing that could happen to you? The Bible says so in many places. Remember the story of the Hebrews enslaved in Egypt and little baby Moses? His poor mother had to put him in a basket in a big river full of crocodiles to save his life from the cruel king of Egypt, but God saw to it that the king's own daughter adopted him! Later, when he was grown, Moses was the man God chose to lead His Chosen People the Hebrews to freedom and back to the Promised Land. And then there's Joseph, who as a boy was thrown in a deep well by his older brothers who wanted to get rid of him because he was much better than they were and he was his father's favorite. Joseph's life too was spared by God, and later he showed his brothers forgiveness and saved them from starving when there was no rain for seven years. That is how God's people acted when bad things happened to them, the ones we admire today and try to be like. God brings much good out of bad situations. What a wonderful God we have, who loves and protects us like this! Truly, he is our Mighty Fortress, our Refuge in trouble who keeps us safe from all harm. Central for Giant Footprints: Tribute to Dakotans and Bryant Pioneers"